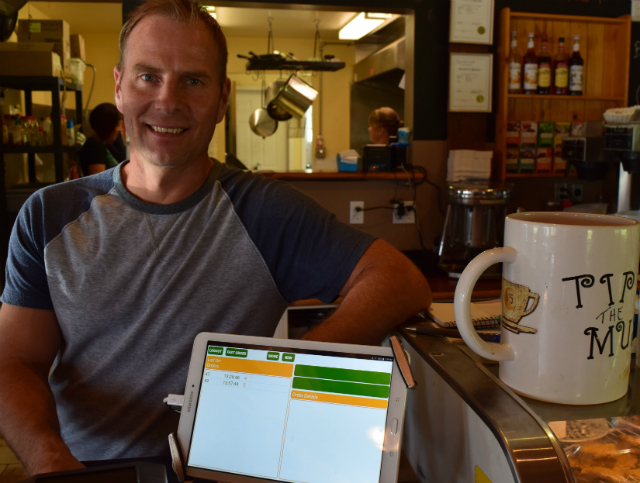 “If I can come in here on a busy day and stand in front of the espresso machine, make drinks and chat with people...that’s where my world is, I love that,” said Shaun Damstrom, owner of the First Perk. For the past 15 years, Damstrom and wife Krista have owned and operated the cafe that sits next to Highway 3. Having grown up around the East Kootenay, it was always their plan to return and raise a family in the area. After several years in Victoria learning “about coffee and espresso”, then managing a brew pub and eventually the Jaffray Pub, Damstrom decided to build the cafe of his dreams on the land where First Perk sits today. His philosophy is more than comfortable chairs and couches, “I want our clientele coming into this facility feeling like their coming to a friends house. I want people to walk away having a great experience,” he said. The extensive menu of great food, plus an espresso and dessert bar, give you an engaging experience full of lively conversation, delicious eats and sweat treats. While the First Perk has only used POS-n-go for a short time, it’s already making a difference in how the cafe operates. Taking on POS-n-go was a “change for us, but its been a positive experience. Its easy to use, easy to learn,” he said. As for the impact on the business, “POS-n-go will streamline a lot of things, its going to be so much better for us,” Damstrom said. Damstrom and staff will surely put a smile on your face and make you leave a whole lot better than when you arrived. Does it get any better than that! First Perk, just off Highway 3 on Aspen Drive in Jaffray, BC.